The Life Sciences Division at TRIUMF was one of the first groups in Canada to produce and supply short-lived (half-life <2 hr) positron emission tomography (PET) tracers for medical research. For over 30 years, TRIUMF has enabled a number of longitudinal neurodegeneration studies at the University of British Columbia. Over this time, researchers have also leveraged their expertise, as well as the laboratory’s expanded particle accelerator infrastructure to explore novel technology in all aspects of accelerator-based medical isotope production. Today, with the world shifting away from reactor-based isotope production, TRIUMF continues to leverage its core expertise to develop new technologies for accelerator (cyclotron)-based isotopes. This colloquium will discuss recent successes that include the development of new solid and liquid cyclotron target technology that are applicable to most cyclotron centers across Canada. A brief summary of TRIUMF’s recently completed project to develop, demonstrate and translate new solid cyclotron target technology to produce Tc-99m will be presented. With that effort now past clinical trials and into commercial development, the team has turned to demonstrate this same solid target technology to produce other emerging isotopes of clinical interest, including Ga-68 and Cu-64. In addition, TRIUMF has established a novel production method for a number of radiometals (Tc-94m, Sc-44, Y-86, Zr-89, Ga- 68, Cu-61) using liquid targets. This approach utilizes liquid target infrastructure which exist in many PET centers, and is capable of dramatically improving the availability of research, and in some cases clinical, quantities of various radio metals without solid target infrastructure or isotope generators. The seminar will conclude with a summary of efforts that are underway to expand TRUIMF’s capacity for production of alpha emitters for therapeutic applications. We are utilizing TRIUMF’s 500 MeV cyclotron to irradiate U-238 and Th-232 targets to isolate alpha-emitting isotopes At-211 (via Rn-211), At-209 (via Fr-213) and Ac-225 and Bi-213 (via Ra-225) using the laboratory’s Isotope Separation On-line (ISOL) infrastructure. Plans are also in place to begin large-scale irradiation and processing of Th-232. With access to all of the aforementioned isotopes, radiopharmaceutical development toward applications in targeted alpha-therapy is underway. 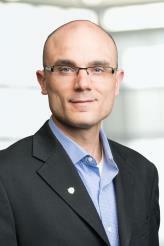 Dr. Paul Schaffer graduated from the University of British Columbia in 1998 with a BSc in chemistry and biochemistry. From there he began his MSc in chemistry at McMaster University and transferred directly in the Ph.D. program two years later. His doctoral work focused on the design and synthesis of technetium and rhenium chelates as potential new radioimaging or radiotherapy agents. After successfully completing his doctoral thesis in 2003, Dr. Schaffer stayed at McMaster for a brief period of post-doctoral work and then settled as a Research Scientist at the McMaster Nuclear Reactor (MNR). In this role, Dr. Schaffer was responsible for demonstrating medical applications for isotopes produced at MNR. In 2006, Dr. Schaffer entered the private sector as a Lead Scientist at General Electric Global Research in upstate NY. There, he was responsible for developing novel radiotracers for GE Healthcare. In the latter half of 2009, Dr. Schaffer returned to Canada to accept his new role as Deputy Head, and is now Head of the Life Sciences program at TRIUMF. He is responsible for maintaining TRIUMF’s medical isotope and radiotracer production programs in support of neurological and oncology research. Dr. Schaffer continues to re-define the TRIUMF Life Sciences program by focusing on its core competencies to deliver specific outcomes, and continues to connect the TRIUMF program with industrial and commercial interests. Dr. Schaffer is a leader, an entrepreneur and one of British Columbia’s most promising talents.